The first challenge in getting to Belgium was getting a taxi. We had not, as yet tried to hail a taxi off the street. As taxis zoomed by, apparently ignoring me, I quickly worked out that there were two types of taxis, ones with red lights on and those with no lights on. Still many taxis zoomed by ignoring me. To make matters worse they seemed to be gesturing at me as though I was stupid. Di helped and still all the taxis ignored me. Eventually a taxi with a green light came along and we realized that a red light meant full, as presumably did no light. Doh. Having secured a place in a taxi we headed to Gare du Nord which is the Paris equivalent of Central station in Sydney. On the way to Gare du Nord I realized how little of Paris we had actually seen. It seemed every corner had a grand church or significant building. 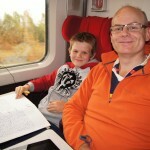 When we got to the station we had well over an hour to kill so I took the kids to McDonalds while Di watched the bags. I had previously said to Matthew that going to MacDonalds in a foreign country was a sin which he promptly quoted back to me, but I was after a quick low stress meal. Anyway the meal was low stress but when we got back to the station we realised that Matthew had left his back pack in the world’s most crowded McDonalds. I left Matthew in charge since Di had since left to get her own lunch and ran across the street to McDonalds, all the way wondering what of value we had hastily thrown in Matthew’s bag. Very fortunately after asking a couple of patrons and a staff member in frantic sign language the bag was recovered in tact. 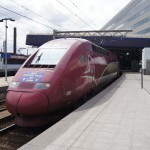 When I returned the train was ready to board and we hoped on our fast train for Brussels.